The blockbuster album has begun looking like something of an endangered species in recent times. The birth of the streaming era, rooted in a track-led culture, has caused artists and record labels alike to question the future of the LP in an age dominated by playlists. The evidence: over 60% of Spotify streams for Drake’s record-breaking, 25-track Scorpion album are of just three songs (God’s Plan, In My Feelings and Nice For What). One recent study even suggested that a mere 16% of adults in the UK are now listening to an album all the way through in any given month. A couple of weeks ago, Apple Music boss Oliver Schusser told MBW of his hope that Billie Eilish’s debut studio album, When We All Fall Asleep, Where Do We Go?, would strongly challenge this trend – and prove that, on the right terms, the album as a body of work still had great relevance amongst a young streaming audience in 2019. The stats are now in, and Schusser’s confidence was not misplaced. MBW can reveal that, on average, those playing Eilish’s album on Apple Music on day one of its release (Friday, March 29), listened to 36 separate minutes of music from the record (ie. not from the same tracks). That equated to more than 81% of the LP’s duration – demonstrating a rare dedication from the average listener of any album, let alone that of a Gen Z alt-pop star. 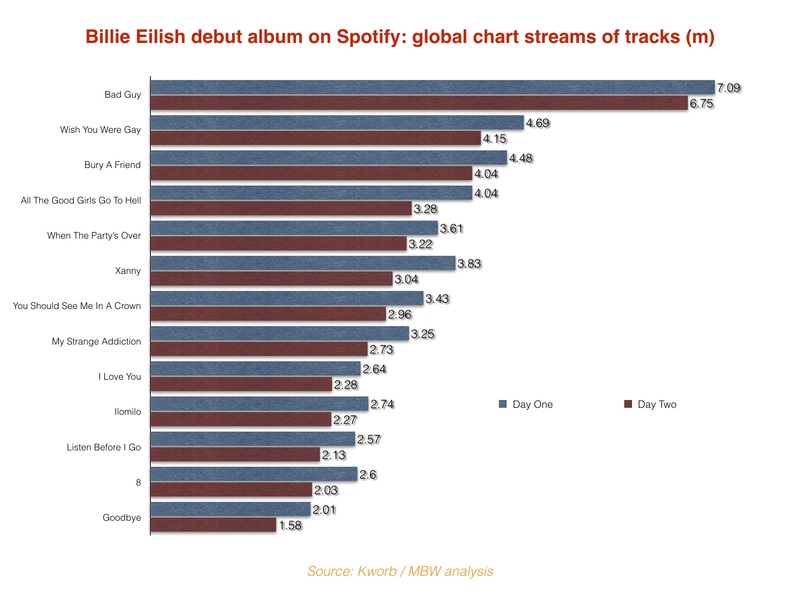 Put simply, it suggests that Billie Eilish’s LP was typically being consumed on day one ‘as an album’ by the majority of the artist’s audience on Apple Music. Apple has made a significant effort to promote When We All Fall Asleep, Where Do We Go? as a single body of work: industry sources tell us that ‘pre-adds’ for the album on Apple Music ended up close to 900,000 ahead of its release. On Friday, When We All Fall Asleep, Where Do We Go? set a new day-one streams record on Apple Music for a rock/alternative album, both worldwide and in the US – reaching No.1 on the platform in 96 markets. Interestingly, one track from the album, Bad Guy, is currently No.1 on Apple Music’s Daily Top 100 Global chart – making it the first ever rock/alternative track to hit the top spot. In total, Eilish has eight of the Top 10 songs in Apple Music’s global chart. Over on Spotify, the attraction of When We All Fall Asleep, Where Do We Go? as a singular record is also being felt – although arguably to a lesser extent. According to MBW analysis of stats from Spotify monitoring site Kworb, the album racked up 46.93m chart-eligible streams on day one on Spotify last Friday. That’s an average of 3.35m streams per song across the record’s 14 tracks. Like Apple Music, the most popular track on Spotify was Bad Guy, which pulled in 7.09m global chart-eligible streams on Spotify on day one, making up 15.1% of all plays on the service in the 24 hours. In fact, the top five tracks from the album – Bad Guy, Wish You Were Gay, Bury A Friend, All The Good Girls Go To Hell and When The Party’s Over – pulled in over 50% (23.9m) plays. That said, even the least popular track on the record, Goodbye, attracted over 2m plays on Spotify on day one. 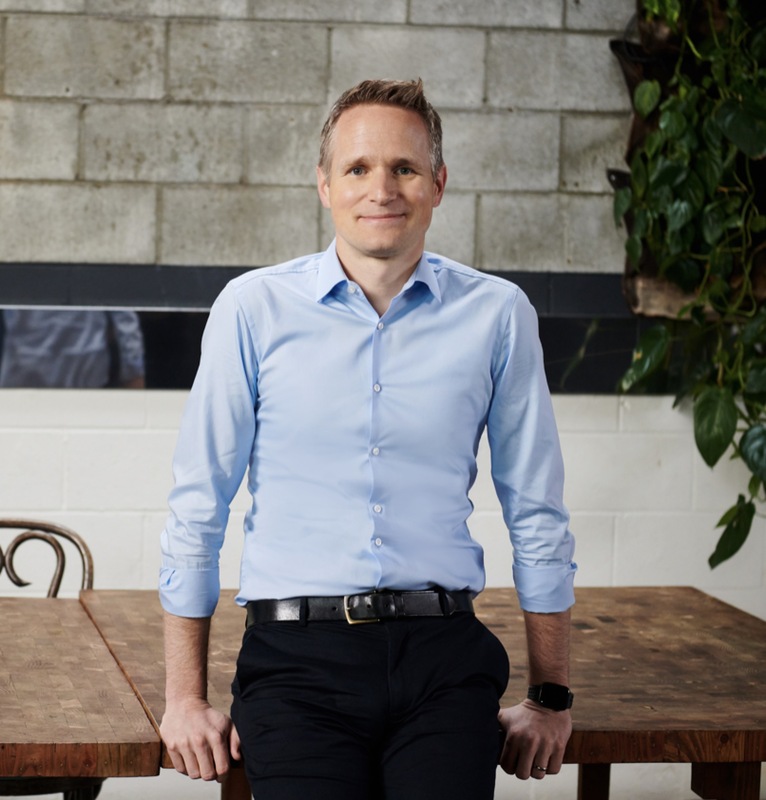 Speaking to MBW last month, Apple’s Oliver Schusser said: “While most services focus the majority of their efforts around playlists, Apple Music still emphasizes albums because we understand their value as a storytelling tool for artists to create context around their music. “To that end, pre-adds are great early indicators of engagement around an artist and the intention of the fans.